Younger Western Europeans, those ages 18 to 29, are far more likely to get news on social media than older adults (those ages 30 to 49 and those 50 and older). In most countries, they are also more likely to be familiar with the news sources they encounter on social media. Their other experiences on social media, though, are similar to those of the two older age groups. Relatively few in each age group say that the news they see on social media is often in line with their own political views. Similarly, across most countries surveyed, few people in any age cohort say the news they discuss with friends reflects their own political views. 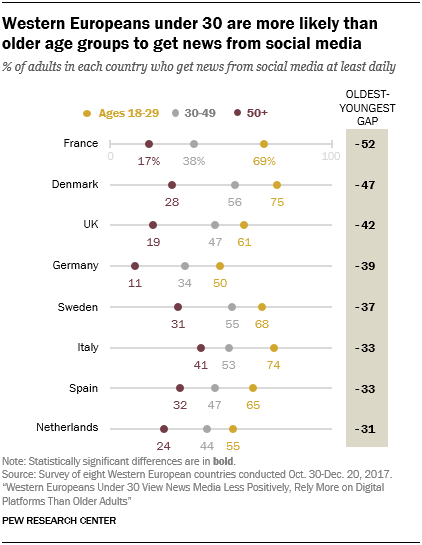 In all eight countries surveyed, younger Europeans get news on social media at far higher rates than older adults. Half or more of 18- to 29-year-olds in each country use social media for news daily. By comparison, less than a third of adults ages 50 and older get news daily on social media, while the rates for 30- to 49-year-olds fall in between the youngest and oldest age groups. Younger adults in Italy and Denmark are the most likely to use social media for news, with nearly three-quarters getting news this way every day (74% and 75%, respectively). Adults ages 50 and older in Germany (11%) and France (17%) are the least likely to use social media for news daily. In France, the low rate of use among those ages 50 and older, combined with the high rate of social media use among younger adults (69%), results in a 52-point gap between the youngest and oldest age groups. Among adults who report using social media to get news, 18- to 29-year-olds are more likely to be familiar with the news sources they encounter on social media than those ages 50 and older. When asked, a majority of younger social media news consumers in the eight countries surveyed – at least 59% in all countries – say most of the news they see on social media comes from sources they are familiar with. Europeans ages 50 and older who use social media for news, on the other hand, are less likely to be familiar with the sources they see on social media in six of the eight countries surveyed. Those ages 30 to 49 fall in between the youngest and oldest age groups, with about half or more in each country saying they are familiar with the sources they come across on social media. 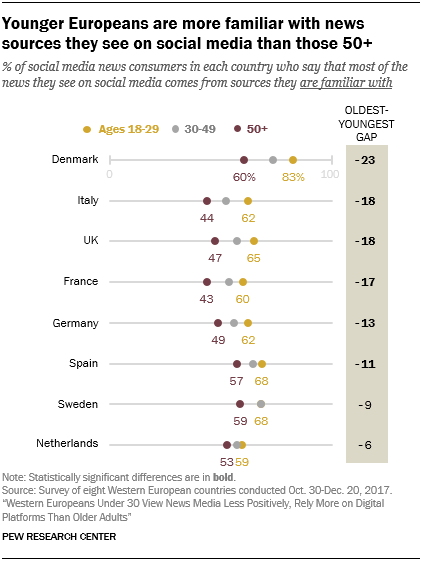 For example, in Denmark, 83% of 18- to 29-year-olds say they are familiar with most of the sources they come across on social media, while just 60% of those 50 and older say the same – a 23-point gap between the youngest and oldest age groups. Those ages 30 to 49 fall between the two groups at 73%. Few Western Europeans, regardless of age, think the news they see on social media reflects their own political views. In four countries – Spain, the Netherlands, Germany and the UK – younger adults are more likely than those 50 and older to say the news they see on social media is often in line with their own political views. But these differences are minimal, and overall, few adults in any age group think this is the case. Across all eight countries surveyed and across all age groups, a minority of social media news consumers say that the news they encounter on these sites is often in line with their own views. 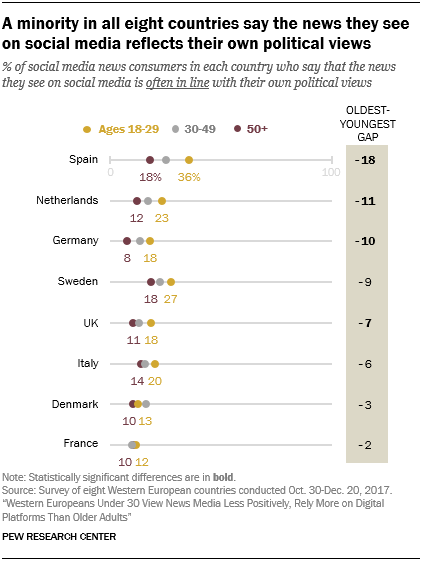 The largest age gap between those under 30 and those 50 and older is in Spain, where 36% of social media news consumers ages 18-29 say the news they see on social media often reflects their own political views, compared with 18% of adults ages 50 and older, an 18-percentage-point gap. A similar trend emerges when looking at interpersonal discussions. Across most countries surveyed and across all age groups, few say the news they discuss with friends is reflective of their own views. The exception to this is Sweden, where about half of all age groups say the news they discuss with friends is often in line with their own views. Only in the Netherlands is there an age gap between those under 30 and those 50 and older when it comes to discussing news with friends that often reflects their own political views, with younger adults more likely to say they do than older adults.